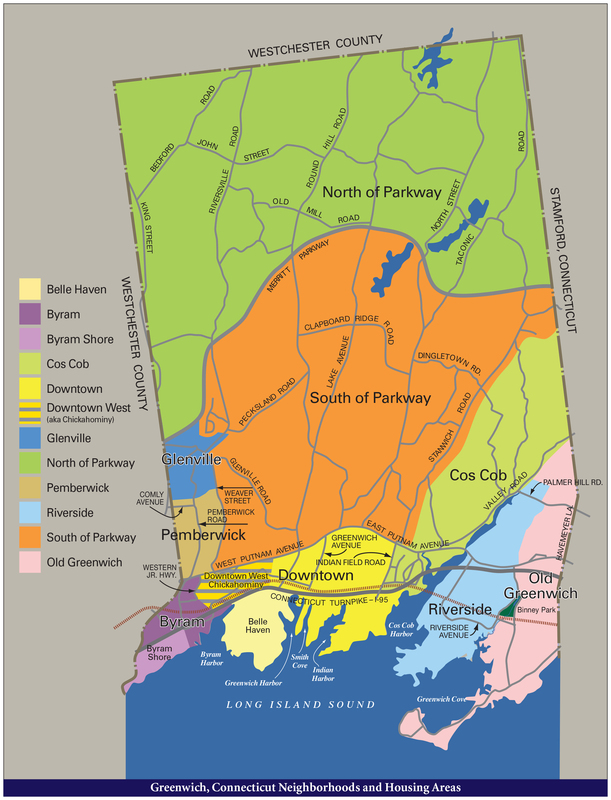 Geography and size: Cos Cob is situated just east of Stanwich Road, north and south of East Putnam Avenue, west of the Mianus River and generally north of Valley Road. Parks/playgrounds/marinas/beaches: Cos Cob features four park areas: Pomerantz-Tuckman, Strickland Park, Montgomery Pinetum and the Mianus River and Nature Park. None have any official play fields but do have nature trails. Cos Cob also has two large playground and ballfield/recreational areas, aside from those located at the Cos Cob Elementary School and nearby Central Middle School. They are the Bible Street and Loughlin playgrounds. Bible Street has two ballfields, two tennis courts, two bocce courts, a basketball court, paddle tennis courts and children’s playgrounds with swings, climbing apparatus, slides, sand box and merry-go-round. Loughlin Playground has one ballfield, two paddle tennis and regular courts, a basketball area and children's playground with slides, swings, monkey bars and climbing apparatus. There is a 300-boat marina just south of Interstate 95. There are no beaches in Cos Cob but within 10 minutes are the beach areas in Old Greenwich and central Greenwich. Recreational membership clubs with facilities: All member clubs with facilities in this area are located on River Road. The Greenwich Rowing Club and the Cos Cob Boat Club are the only waterfront clubs in the area while the Greenwich Racquet Club offers tennis. Shopping and restaurants: Most of the shopping in Cos Cob is in the area’s central Hub. Along East Putnam Avenue there are a number of smaller stores as well nationally known CVS. In addition there are a half dozen restaurants/food service establishments and a Starbucks Coffee. Transportation: The Cos Cob train station, set near Interstate 95 and the Cos Cob waterfront and offers good access to Cos Cob residents. The major roadways in the area are Interstate 95 and East Putnam Avenue (Route #1). Connecticut Transit operates buses daily with one stop in Cos Cob at East Putnam Avenue and Orchard Street. Travel time to mid-town Manhattan, no matter the mode of transportation, is between 40 minutes and 60 minutes. Neighboring Stamford is no more than 15 minutes away.